Congratulations to Aisha Lumumba! She has just published her own quilt catalog! 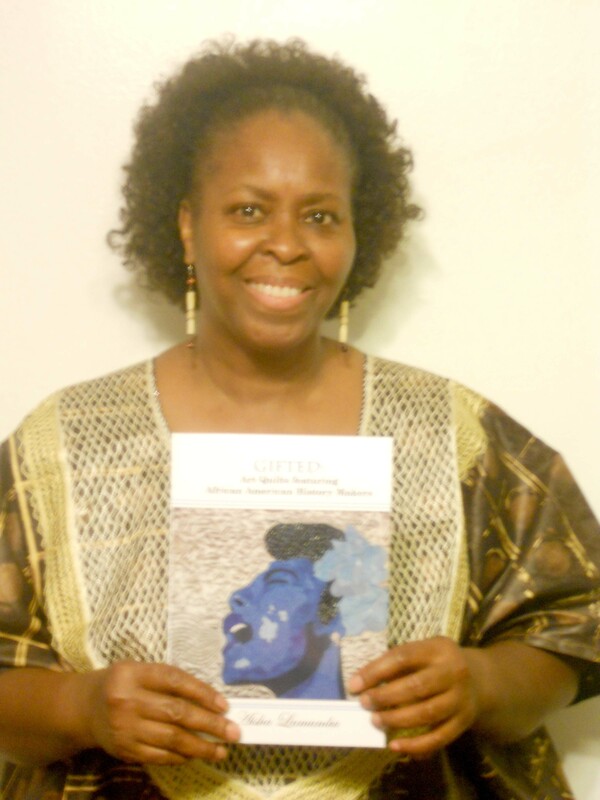 Gifted: Art Quilts Featuring African American History Makers is a 28-page, full-color softback catalog showcasing quilted portraits of prominent Black Americans such as Harriet Tubman, Whoopi Goldberg, Oprah Winfrey, Sidney Poitier and president and Mrs. Obama. I asked Ms. Lumumba yesterday if she would answer a few questions to give insights to others who are following the Publish Your Quilts blog. What motivated you to create a quilt catalog? Mrs. Lumumba: I was motivated to create my quilt catalog by Ms. Kyra Hicks. First, I had seen the advertising for her book, How to Self-Publish Your Own Quilt Catalog, and I made a mental note to get one. When I finally got the workbook in my hands, the wheels inside my brain started to roll. I opened the package at the post office and read (the workbook) at red lights on the way home. I sat down and read the book in its entirety before I put it down. I was so inspired that I knew right away what I wanted to do. Was your publishing process difficult or expensive? The Publish Your Quilts blog and the workbook were both very helpful. I felt like the blog gave me a chance to communicate with the author, that I would not have otherwise with just the book. The process was so easy. The workbook laid it all out very clearly. I simply followed step-by-step. The beautiful truth is that it cost me absolutely nothing. When I tell others that I did it for free, they look at me like something green is dripping from my head. It is an amazing process. I used CreateSpace to publish my catalog. I found it really easy to use as well. Whenever I was stumped, I called them up. They responded immediately. The customer service was great. How does it feel to have a finished catalog of your quilts? The only answer I can give is giggly! I remember being young and everything was funny. My girlfriends and I would laugh for hours, sometimes at nothing. My friend's mother would say, "Why are you all laughing?" That is how I feel about my new book. I feel like laughing for no reason. When I first saw my catalog online and available for sale, I was over the moon with excitement. This is something I have wanted to do for a long time. Ms. Hicks has opened a door for me with the information in her workbook. What advice do you have for other quilters or guilds considering making a catalog? I advise anyone considering making a catalog to go for it. "Nothing beats the heck out of a failure, but a try." It costs nothing to try it. I'd say make sure you take quality pictures of your work. I know many people may be afraid to take such a big step, but if you do, you will find that it is well worth it. Dare to be like Nike: "Just Do It."